Do Roof Coatings Really Protect Roof Membranes and Extend Roof Life? Absolutely! Roof coatings lengthen the life span of your current roof membrane by protecting your roof from moisture and the damaging effects of the sun. There are three elements that cause the most damage and increase the aging rate of roofs – moisture, ultraviolet rays and infrared radiation. Moisture is obvious as it causes deterioration and rotting of the roof substrate. This leads to a weaker substrate, prone to leaks and other damage inside the building, as well as, in the surrounding areas of the roof. Ultraviolet (UV) rays are harmful because they initiate a chemical reaction that begins the process of breaking down the roof substrate, weakening its ability to protect the assets below. The infrared radiation is the actual heat from the sun, which intensifies and increases the chemical reaction that is occurring from the UV rays. The combination of the UV rays and infrared radiation is detrimental to premature roof failure and aging. 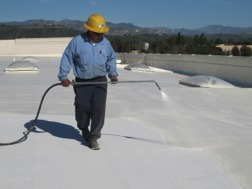 Roof coatings protect the substrate from this occurring, in turn, lengthening the life of the roof exponentially. There are different roof coatings for different purposes and different substrates. National Coatings offers a wide range of roof coatings for asphalt, single-plies, SPF, metal and concrete substrates to meet your roofing needs. Our maintenance systems protect and lengthen your roofs’ life every 5-10 years so you can avoid a roof replacement indefinitely. Our roof restoration systems restore your already aging roof to a brand new roof that can then be maintained – also allowing you to avoid a costly roof replacement indefinitely. We specialize in high quality, durable roof coatings to provide you with the ultimate sustainable roofing system. For more information download our Systems Brochure or one substrate brochures: Asphalt Roof Substrate, Single-Ply Roof Substrate, Metal Roof Substrate, and SPF Roof Substrate. What is "Critical Peak Pricing?" How does it Relate to Roofing? More specifically: How can electrical utility initiatives help me save money when I coat my roof white? Critical Peak Pricing (CPP) is a pricing model used by electrical utilities where the cost per kilowatt-hour varies, depending on time of day. Electricity peak demand times, usually in the afternoon in the summer, will be charged at a premium or higher rate than other times during a 24 hour period. The term "net metering" is sometimes used to determine and record peak demand. Electrical utility companies have begun installing "net meters" that calculate kilowatt usage during "peak demand" and "normal or low demand" periods. This information is used to determine costs based on this two-tier pricing model. "So how does this relate to roofing?" If the user can reduce electrical usage, they will save money. This can easily be accomplished by reducing air conditioning electricity usage. A very easy and cost-efficient way to achieve this is to coat the building's roof with a white reflective roof coating. The roof life extension benefits of white reflective roof coatings have been well documented. Now, the initiative described above offers even more of an incentive to coat your roofs white with National Coatings AcryShield roof coatings. Download our Roof Coating Systems brochure to find out more. Elastomeric roof coatings are excellent at sustaining and restoring existing aged or leaking roof membrane. All roofing materials require proper application and maintenance to perform to their fullest – roof coatings are no different. When applied and maintained properly, elastomeric roof coatings offer cost savings benefits by prolonging your roofs’ life and reducing energy costs and usage. 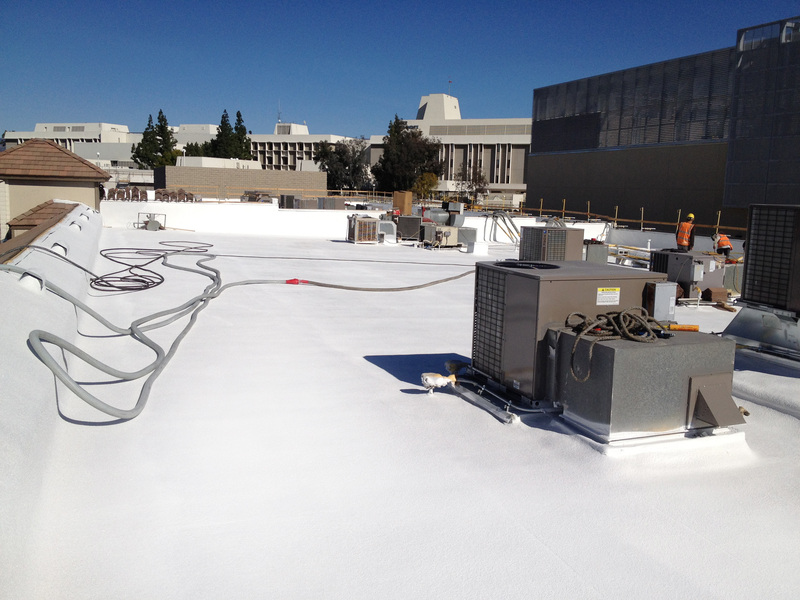 Elastomeric roof coatings are ideal for restoring and maintaining Asphalt roofing (BUR and Mod Bit), Single-Ply roofing (TPO, EPDM, PVC and Hypalon), Spray Foam roofing (SPF), Metal roofing and Concrete roofing. The coating systems allow the roof to be renewed and restored – achieving a watertight, fully seamless, brand new roof membrane. AcryShield roof coating systems are the leading coating systems in the industry allowing you to restore your roof indefinitely. When proper roof maintenance is performed, a fully restored roof coating system can be re-coated every 10-15 years, allowing you to avoid a costly roof tear-off forever. Roof coatings with high Ultra-Violet (UV) blocking pigments are the best choice for a roofing material that needs to provide you with durability and protection from the sun’s harmful and damaging UV rays and heat. Roof coatings containing large amounts of these UV blocking pigments allow the sun’s heat to be reflected back into the atmosphere (a process otherwise known as solar reflectance) without the building absorbing much of the heat (a process otherwise known as thermal emittance). This keeps the temperatures inside the building down. The greater ability to reflect the sun’s radiation, the cooler the building remains, and the less air conditioning is needed to create a comfortable temperature for the occupants inside. The Cool Roof Rating Council (CRRC), an organization that accurately and credibly evaluates solar reflectance and thermal emittance of roofing materials, has rated our AcryShield roofing products highly - check the ratings out! The AcryShield roof coating line has be proven to lower energy consumption and save on air conditioning costs. If you are looking for a roofing material that extends your existing roofs’ life, lowers energy costs, and provides a brand new waterproofing membrane without a costly roof replacement, download our Full Line Brochure or our Considering Coatings Guide – they are FREE! You can also check out all our credentials and ratings – our AcryShield roof coating systems and products are fully compliant with building codes and energy conservation programs.